At 76 years of age, Donal Corcoran has no intention of hanging up his walking boots, despite having already walked over 5,000 miles in Slovakia, Austria, Hungary, France, Croatia, Slovenia, Italy and Portugal and Spain. 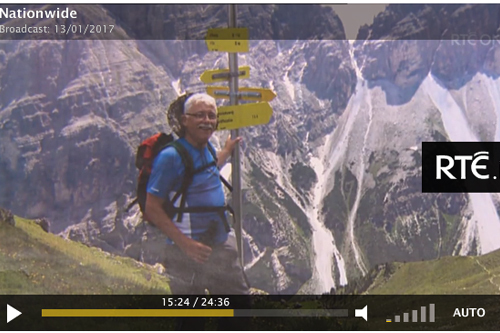 The former teacher started his long distance walking in 2010 at the age of 70, by undertaking the project of walking 1000 miles from Le Puy in France to Santiago de Compostela in Spain. Donal began walking as a cancer fundraising drive in memory of his late wife Doreen who sadly passed away in 2007. Doreen was diagnosed with ovarian cancer. Doreen was a patient of Dr John Kennedy at St James’s Hospital and Donal continues to fundraise in memory of Doreen and for others who are going through the same experiences. Donal is a wonderful ambassador for positive ageing. He has run 10 marathons, has represented Ireland as European Peace Walk Ambassador and has had many adventures on his epic walks around Europe. A keen gardener, singer and sean-nós dancer, Donal believes that anyone heading towards retirement shouldn’t fear it. In his recent interview with RTE’s Nationwide, he said, “Get out and do whatever you want to do, age doesn’t matter at all”. Watch RTE’s Nationwide feature on Donal. Segment starts at about 13 minutes into the programme.